Docebo White label APP allows you to hide some Docebo’s custom branding elements from your Docebo E-Learning Platform. 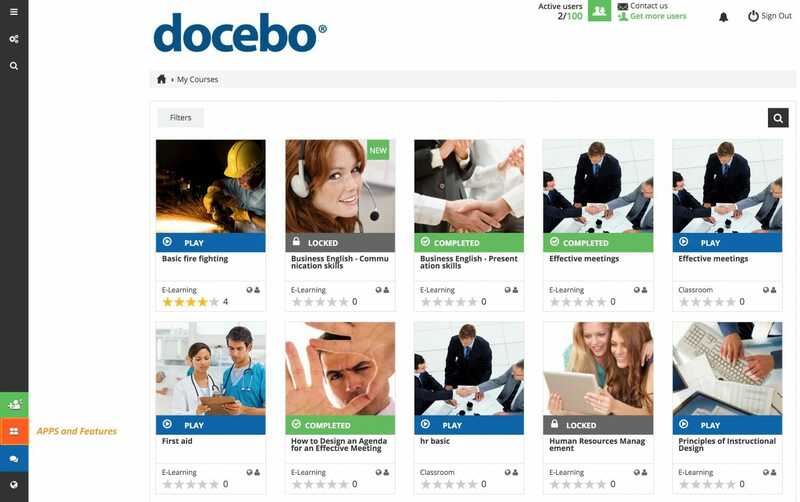 remove the word DOCEBO in any page of your E-Learning platform. You can activate White label APP through the APPS area. Note that during your trial period you can try all the APPs for free. In order to activate the White Label APP, select the Additional features tab. Choose the White Label APP and select the TRY IT FOR FREE button. Select again the TRY IT FOR FREE button to complete the operation. 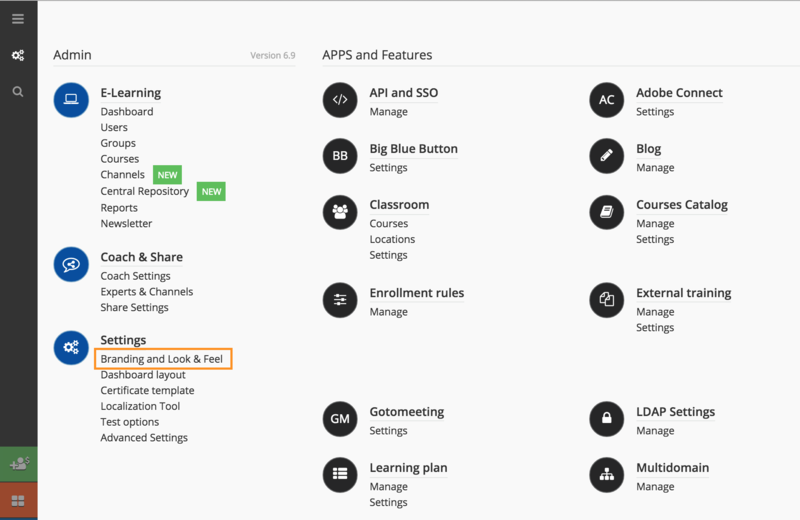 In order to manage the White label APP, click on the Branding, Look & Feel item in the Settings section of the Admin Menu. Then, select the Docebo White label tab. Now you can customize the header. For those using Docebo 6.8 or higher, you can include external custom elements in the header, present in other websites by inserting the external URL. Now you can decide if you would like to display, or remove the Powered by Docebo from the footer. 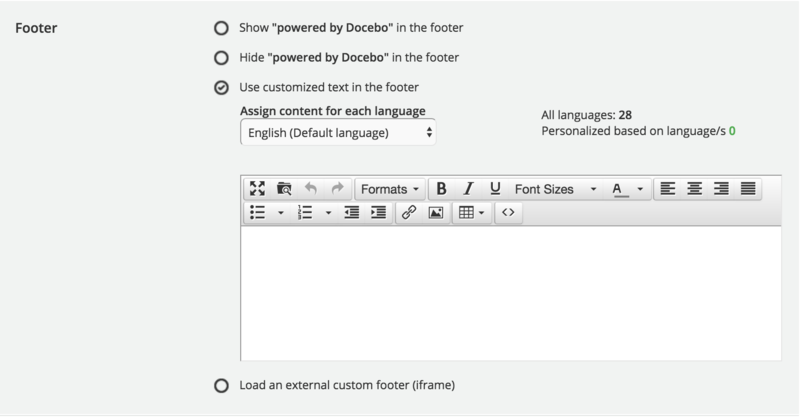 If you’re using Docebo 6.8 or higher, you can create your own footer instead. To choose this option, select the Use my custom text option. You can also include external custom elements in the footer, present in other websites by inserting the external URL. In order to hide buttons from the sidebar, use the Menu option, which is shown below. Now, only you are able to view these buttons on the site. They will be hidden from the the other administrators. Decide if you want change the recipient of the Help desk/Contact us button. You can also insert your own e-mail address if you would like to receive administrator requests. Please note that if you change the email address contained in this field, all the other platform super administrators (except you) will send the help requests to the address written in it: this means that the tickets open by them won’t be forwarded to the Docebo HD. You also have the option to replace the name Docebo and the link www.docebo.com with your own brand and your site. Remember to select the SAVE CHANGES button in order to save your preferences.